While attempting to install your IDAutomation product the installer stops before it reaches 100% and the product is not installed. The issue is caused by an old version of the installer that copies the font to the appropriate Fonts directory. There are a few ways to resolve the issue. NOTE: The issue is corrected in the updated version of the font packages (released in 2014 and beyond). User may also want to attempt this solution before installing the fonts. Re-run the installation until it completes. 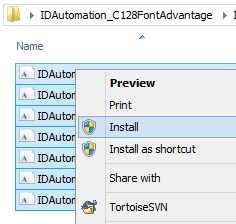 Install the font using the Windows method. 4. 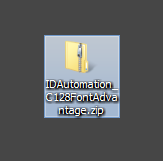 Double-click the IDAutomation_C128FontAdvantage folder. 6. 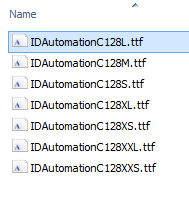 Left-click the first .ttf file, press and hold the Shift-key, and use the down arrow key to select all of the font files. 7. Right-click and select Install.